I definitely have Christmas on the brain (I'm finishing up my Holiday round-up!, so be sure to check back tomorrow), but I don't want to forget about Thanksgiving. 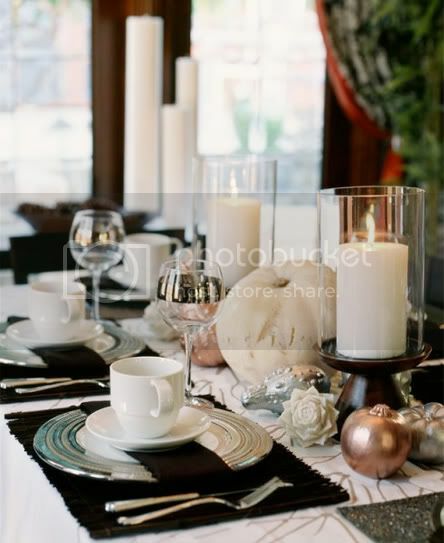 So I have gathered some tablescape inspiration to get your gears turning for your holiday table! Can you believe that Thanksgiving is a little more than a week away? 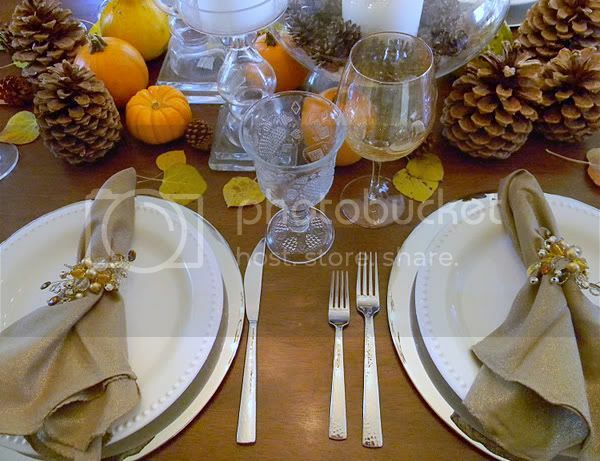 Do you go casual or get fancy with your table for the turkey? Do Tell. SO lovely! That first one is gorgeous! Well, a great set-the-mood for Christmas, as we don't have the Thanksgiving Celebration. 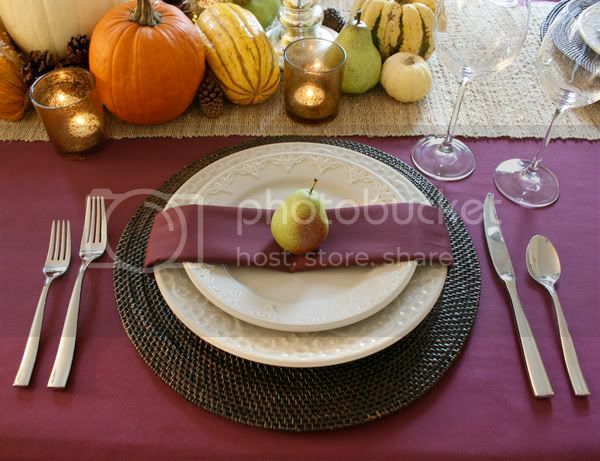 I have yet to host a Thanksgiving dinner but I would love to have my table look as pretty as the last one you featured. They are all so lovely! I adore how they all have pumpkins, fresh fruit, or pincones mixed in. Thanks for the great inspiration! 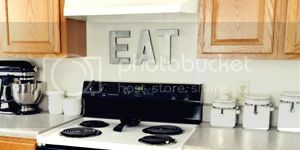 i love a casual, homey feel. all these pics are great!! Some holidays I wish I could plop into someone elses dining room. All are gorgeous of course! But you need a buffet too...no room for mashed potatoes on that table! my family goes crazy at thanksgiving!! centerpieces and decorations all over the table, for sure!! love those tablescapes jessica. i wish i was more creative with my thanksgiving table, i might start with place cards this year and gradually work my way up. but your photos definitely gave me inspiration! I love the first one and was thinking white would be so pretty for Thanksgiving! Looks like great minds think alike! I've been thinking about table center pieces for Christmas! ooh i wrote about the table today too! :) i like casual with a hint of classy. these are absolutely beautiful! I'm getting so many good ideas today! totally casual, but i dream of one day having table like any of those. the only fancy thing we do is eat on the fine china. haha. 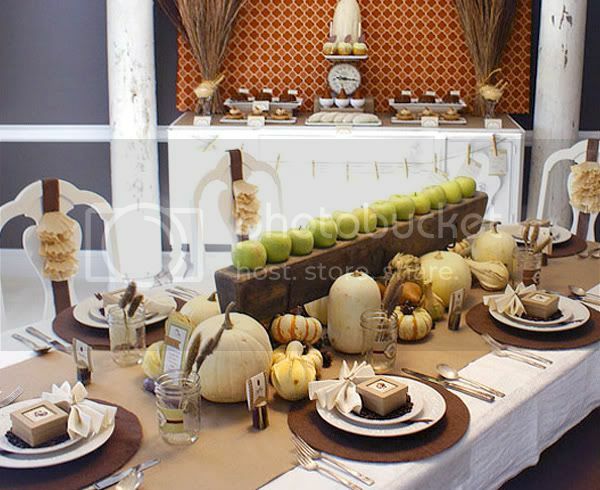 I love the apple centerpiece! I'm trying to use something edible so that it can be put to use later...in my belly. I love the top tablescape. Something about white pumpkins and gourds that is unexpected.